Jennie and Ben returned from (Re)Generation Who after three days of the best Doctor Who Convention EVER. After taking a few days to recover they sat down to recount their exciting weekend in Hunt Valley, MD. As you’ll hear in this episode, words escape them. There was just too much happening all weekend to fit into one show. Playing Doctor Podcast would like to take a moment to thank the creators of (Re)Generation Who, Oni and Harknell and the wonderful staff they gathered together to make such a terrific show. The entire weekend was filled with meeting old friends, making new friends and tears of joy. 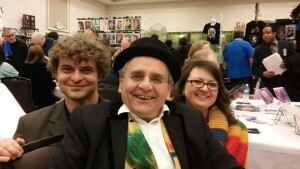 The guest list was phenomenal and we enjoyed meeting Colin Baker, Sylvester McCoy, Tom Baker (via Skype), Nicola Bryant, Sophie (Aldred) Henderson, Andrew Cartmel, Terry Molloy, Deborah Watling, Patricia Quinn, Colin Spaull, Nev Fountain, and so many more that we feel bad for leaving anyone out. We were busy working our table and doing panels so we didn’t get to go to all of the unbelievable programming. We especially wanted to see Bree Geek’s Weeping Angel Robot but it was standing room only in that panel. We met a few other podcasters doing live shows and want to send a shout out to our Trek brethren at Trek Off Podcast. We recorded a few minutes with them by way of introduction and look forward to dropping by their show some time in the future. We let Future Ben (he says Proper Ben) out of Jennie’s basement to record with us. Ben Taylor is a big part of our con family and he keeps us in line. Whether he’s spreading the word about Playing Doctor Podcast or manning our table when Sleepy American Ben won’t wake up on time, we can always count on Proper Ben to do right by us. This year we introduced a new merchandise design by Jennie. You may have heard about the TARDIS Access badge or seen one if you were at the convention. We greatly underestimated the popularity of these badges and sold out on Friday. We will be contacting the folks who signed up for one soon and everyone else can catch up with us at Tidewater Comicon or Intervention to pick one up. Again, Future Ben was a big promoter of the TARDIS Access Badge and I think his wearing it around the con helped us to sell out. Be sure to keep an eye on this page, Facebook, Google+, and Twitter to find out all about our upcoming appearances. We love meeting listeners and making new friends.